HOdlcoin (HODL) is a relatively new experimental altcoin that can only be mined with the CPU for the moment using the coin’s wallet and although it is a PoW coin you get interest on your wallet balance and there is an option for deposit with even higher interest rate. The algorithm of the coin is made in a such way that early adopters holding their coins in the wallet get higher interest rates with the idea to attract more users resulting in a wider coin adoption for a shorter period of time. The regular interest rate is 5% APR, but with the extra bonuses and deposits the interest can grow exponentially. The deposits work in a way very similar to PoS, though there are some differences, your coins are locked for a period of your choice and the longer the deposit, the higher interest rate you get. To check the current interest rates and bonuses you can visit the HOdlcoin Interest Rate Calculator. The coin uses 1GB AES Pattern Search Proof of Work algorithm that involves filling up RAM with pseudo-random data, and then conducting a search for the start location of an AES encrypted data pattern in that data. 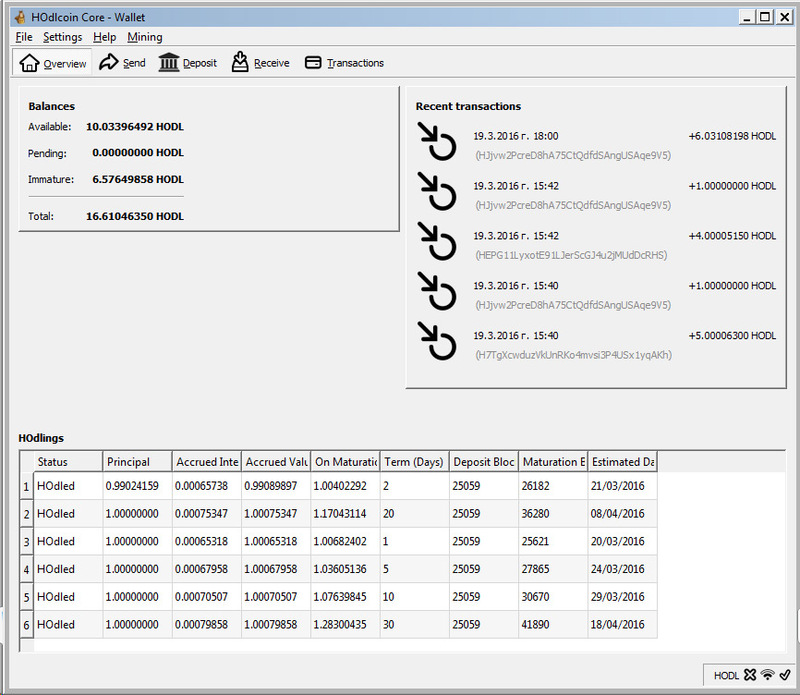 Pattern Search is an evolution of the ProtoShares Momentum PoW, first used in MemoryCoin and later modified for use in CryptoNight (Monero, Bytecoin), Ethash (Ethereum). For the moment you can only mine HODL coins with your CPU via the wallet, there is no separate miner available yet or a pool where you can mine the coin. This means that you will have to run a separate HOdlcoin wallet on every computer where you want to be able to mine the coin and since it is solo mining luck can also play big role in how much you might be able to mine.